If you are a hockey fan – and unless you live under a rock – you would know that the Vancouver Canucks played their first game of the season on October 6, 2011. Even though this would be a momentous occasion for the city’s sports fans at the best of times, this game carried with it the added weight of being the first since the notorious “Riot” that occurred after the Canucks lost the Stanley Cup last June. To our great dismay and embarrassment, The Riot was viewed by people all over the world, thanks to today’s inexhaustible technology. Friends of mine in Japan saw it, as did my friends in Egypt, Paris, the Philippines, and South Korea. My friends and relatives in Edmonton, Florida, Toronto, Los Angeles, and Washington State wrote to me expressing their concern. 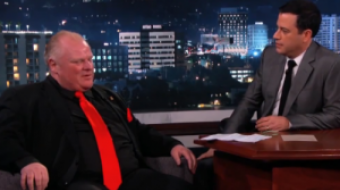 Those of us here in Vancouver who were not at the game that evening watched the late night news on every channel, awash with horrendous disbelief - our mouths agape as we witnessed the complete stupidity of that drunken mob – egged on by their moronic onlookers. They overtook our beautiful city that night, wounding its downtown core in an appalling spree of violence and looting. And yet, in the morning after, those wounds did begin to miraculously heal as over 10,000 Vancouverites showed up downtown, brooms and mops in hand, to begin the massive clean-up. Those of us who love this city signed the boards of the later-named Wall of Hope and swept the streets that had been so drastically assaulted. We smiled and said hello to each other and made new friends. A brand-new community seemed to rise up from the ashes of the treacherous night before. Although I am not usually a ‘joiner’ of groups, when I heard about a meet-up group called iCommunity, I knew I wanted to get involved. iCommunity is a self-organized collection of people who purely and simply love Vancouver -- whose mission is to make sure that what happened on that tragic night in June will never happen again. We believe in the power of taking ownership of our future and bringing back the true spirit of Vancouver. And we want to inspire others who feel the same way to take positive action along with us. So on October 6th, iCommunity went to the hockey game – or more accurately, to the plaza of Rogers Arena. We set up two huge boards, reminiscent of the plywood boards covering the windows of downtown businesses like Blenz, The Bay, and Budget Car Rentals that had been signed by devastated yet caring Vancouverites during the clean-up. And once again, we smiled and said hello to total strangers -- this time the people who were on their way to this exciting first game of the season – asking them if they wanted to sign our boards which we are calling The Wall of Hope 2.0. On one board they wrote their hope for Vancouver, and on the other what they wanted from our hometown hockey team. And we found out that people do indeed care – for in just over an hour, more than 200 people had signed our boards. Let’s bring home the Cup! That we finish the season strong and play with heart in the playoffs. Go Canucks – pick it up… The Cup! Do the best you can and you will be Champions! Yes, we can ~ believe! That we stand up for our City! Never underestimate the power of the good people of Vancouver! I hope we learn that whatever unites us is stronger than whatever would divide us. The people of Vancouver have spoken, in no uncertain terms – our collective spirit of good will toward both the city and the hockey team many of us love is alive and well. 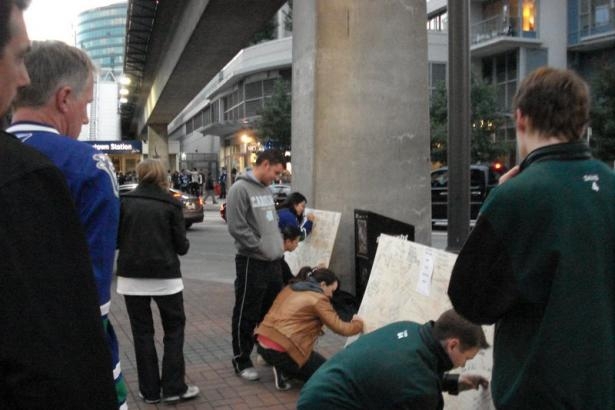 “We saw so many people come and express their care for Vancouver and the Canucks. It was amazing. They got it right away that these boards were about hope and caring for the city. What an amazing group of people! If you or someone you know is interested in becoming part of our group, you can find us online at http://icommunitymetrovan.org/. I’ll look forward to meeting you there – saying hello and sharing a smile!